Many schools in various countries have inclusive incentives to teach for them. These incentives most commonly include accommodation, flight reimbursement after completion of an annual contract, travel and holiday benefits, and some schools even offer meals when you are at the school! All of these incentives can help you save some serious dollars as an ESL teacher, so it’s great to find out what incentives you will be receiving. As most of the high living costs in Australia are thanks to our high rent prices (thanks to an inflated real estate market), you can save a lot of money by choosing a country that includes accommodation costs. China is the best country for this because they will cover your accommodation costs and still pay you a great salary. Capital cities are not only competitive when finding a job, but the cost of rent, eating, and monthly living expenses is much higher. The cost of living and eating out is a lot cheaper in smaller cities, which translates to even higher monthly savings. Plus you will save money on transport in smaller cities because you will be able to walk or bike everywhere. Most positions that include accommodation will ensure that the accommodation is close to the school you are teaching at. But if you need to go somewhere else, try to avoid costly taxis and use the public transport system. Or even better, get one of your local colleagues to recommend the local rideshare apps (each country has their own), help setup your app, and teach you how to use it. China even has cool rideshare apps for scooters and bikes, complete with your own designated driver, to get you home after a big night out! This will save you so much money, and keep you safer, in the long run. Life is about trying new and exciting things. Not only will eating at local restaurants give you the chance to try exciting new cuisines but the locals generally eat in the restaurants with cheaper prices and better food. Avoid restaurants filled with tourists, these restaurants are generally priced higher because the tourists’ budgets are a lot higher. Also, when choosing a local restaurant, our insider tip is to choose a local restaurant that is busy. This way you can ensure that the food is freshly made, regularly made, and is delicious. Even wait in line if you need. A line means the food is great! Buy your fresh produce from the markets not the big supermarket chains. Local markets have direct sources from the farms and less overheads so they are more likely to have the cheapest prices for produce. Also, the markets will only stock the produce that is in season. So, you can be assured that you are getting the most fresh produce. Look out for supermarket chain specials like half-price or discontinued foods by checking digital catalogues in your area. Regularly checking for sales means that you can bulk buy and save money on items that you know you regularly use. An added tip is to meal plan on Sunday and base your meals around the specials in your area. Don’t be brand loyal. You probably won’t be able to get your favourite Australian brands overseas without paying an arm and a leg for them. So, don’t let brand loyalty eat into your savings. Try the local brands of your favourite things, like beer, cereal, and washing detergents etc. You will save money on import costs and these are the brands that would most likely be on special. Here’s a sneaky tip for our TESOL teachers in Japan – Some Japanese supermarkets discount their pre-made meals by up to 75% in the late evenings. These completed meals kept us going on many TESOL internship trips in Japan. This means that your salary is worth on average 30% more (at time of posting) in Australia dollars – so you can send your savings back to Australia and that translates into 30% more savings. This 130% savings amount can be used in Australia to pay off those pesky debts that have piled up in Australia or to invest and grow your wealth. Want to earn more money as an ESL teacher? Check out our post on Monday. 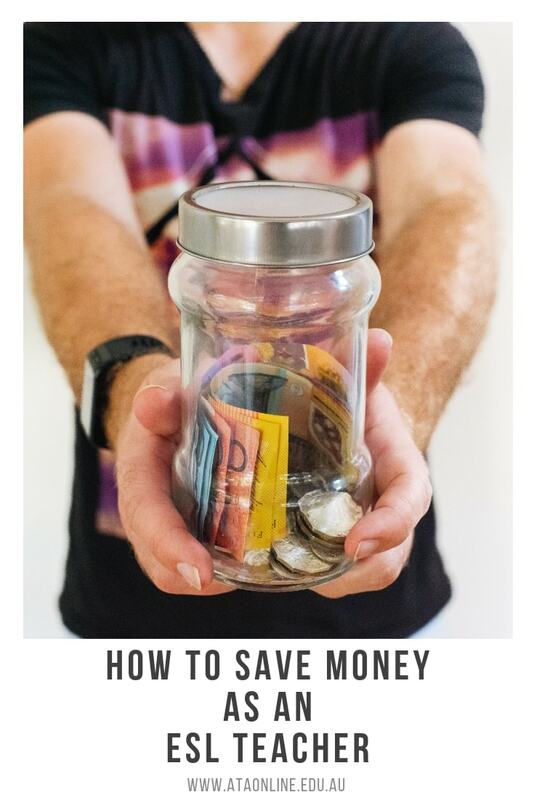 Comment below if you have any other savings tips.